Songbird is a very popular open source audio and media player that managed to achieve significant popularity from the moment it appeared on the market in February of 2006. It continued to grow and expand its capabilities for years to come, led by the developers in the studio named “Pioneers of the Inevitable“, managing to become one of the most fully-featured and capable audio playback apps that could satisfy everyone from novices to owners of large digital music libraries. However, after almost seven and a half years, development of Songbird was discontinued in June of 2013. Today, Songbird still lives as an open source app that is still downloaded and used by new and old users from all around the word. Interface of Songbird resembles the one from iTunes, although with more care being placed not only on usability but also wide variety of advanced features such as wide codec support, skinnable interface, keyboard shortcuts, metadata management, integration into iTunes (including AirPlay) and more. Used by millions of fans to access, manage and play all their music. Let Songbird be your desktop media hub! 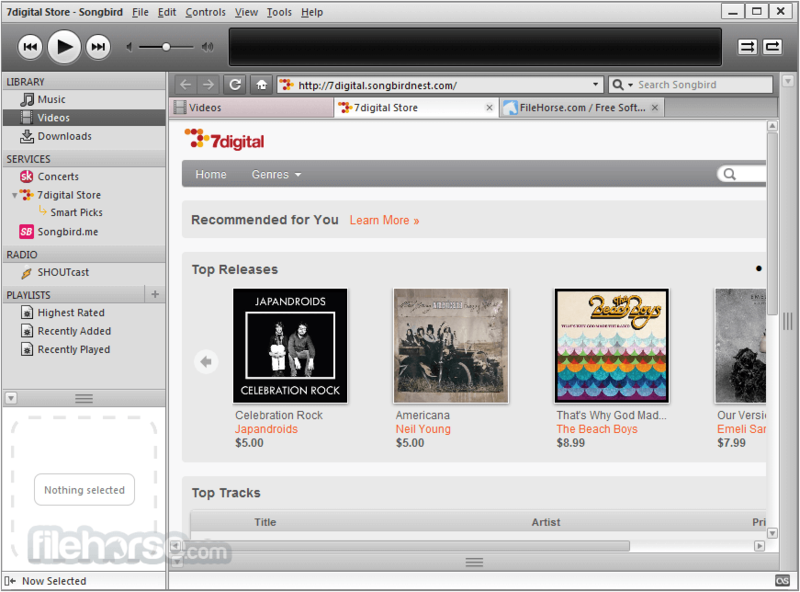 Now includes Songbird.me so that you can easily discover new music that’s personalized and delivered straight to you. Share your music interests with your friends. Songbird works with many integrated services like 7digital Music Store, mashTape, Last.fm Scrobbling, Concert Tickets and SHOUTcast Radio and others. Discovering new content with Songbird is easy. You can use it to watch video clips, movies, find out when favorite bands play your town, and discover new tracks by hot new artists. Songbird suggests new artists and new music based solely on those you already love. It’s personal, unique to you and your tastes. See which artists your Facebook friends are into. Purchase albums and songs directly through Songbird from 7digital; easily sync to your mobile devices. Note: Songbird was dicontinued on June 28th 2013 due to problems with future funding of the project.